I just got home from roaming around the woods for more than a week with my kids and found your letter, dear friend. Thanks, brother: it’s terrible that of all the comrades living in the USSR and abroad, you alone keep in touch with us. Never mind the others, but it sure would be been nice to talk to you once in a while. Concerning Rubinchik  – not a word from him in more than three months. From Baron no answer to my letter which was sent three months ago. The person I exchange letters with most often is Vanya Kabas . In the recent past the poor man was “totally absorbed in searching for an apartment, or, at least, a different place to live”, and now he is in prison in Moscow. It’s not surprising that Moscow is so inhospitable: the concentration of “inhabitants” is so great that “apartments” can not be provided for all. I have learned, for example, from very reliable sources, that many people “of the same or closely related profession as Vanya” have found themselves in an identical situation – roughly 200 people. Yes, I forgot: Kharkhardin , Solonovich  and others, who were previously helping their poor relatives, have, thanks to the failure of their enterprises, found themselves in the same position as Vanya…. On two occasions we have received communist newspapers from America (Chicago): “Novy Mir” and “Russkiy Golos” . I have no idea who sent them. Perhaps you can find out who has done us this favour. We know we have relatives in America, but we don’t know which ones are concerned about us. I can only say that their gesture is most welcome. Dear friend, you are justified to reproach me for being unreasonably cautious, resulting in prolonged silences. I myself constantly curse the state of mind from which I continue to suffer. Yes, I became quite withdrawn, unsociable, even anti-social; and this happened to me after my “illness”, of which you are well aware. It’s all too clear to me that it will take some major event (good or bad) to shake me out of my pathological apathy, peevishness, paranoia, etc. … I hope, dear friend, that you will understand and not judge me too harshly… News about the USSR is known to you from our newspapers. I can only add that many of the “settlers” among our comrades are being “resettled” from Turkestan to Siberia; they are quite distressed… This is the way life goes on here, friend: constantly being moved around, deprivations, etc., etc. … It’s a hard life!!! And yet one doesn’t necessarily agree with Gogol: “It’s dull in this world, gentlemen!”  I only hope that this letter reaches you. 1 Yefim Borisovich Rubinchik-Meier (1892–1938), anarcho-syndicalist. 2 Ivan Vasilevich Kabas’ (1893–?) was deported on the Buford (“alias Dimstrius (or Dimitrius) Arrested without a warrant because present at the house of friend Tony Chinelli during the latter’s arrest. From Grodno, Russia. Came to U.S. in 1913. Worked in Youngstown in steelworks and fireproofing company. In Akron, worked at tire factory. Opposed to czar in Russia, not to U.S. government.”: Buford bios). He was on the executive of the Nabat Confederation. “Workman. Arrested in Kharkov in November 1920 and, after several hunger strikes and transfers from prison to prison, he was assigned administratively to the Kholmogory concentration camp for two years. In the wake of the beatings inflicted upon the anarchists there in November 1922 he was removed to the Pertominsk camp. Freed after serving out his term, he was rearrested after a short time and banished to Briansk where he was arrested again and dispatched to Arkhangelsk. In 1926 he was arrested yet again for having corresponded with friends abroad and locked up in Petropavlovsk.”: 1927fre. 3 Ivan Vasilievich Kharkhardin (1899–no earlier than 1939). 4 Alexei Aleksandrovich Solonovich (1887–1937). 5 These newspapers were actually published in New York. 6 The last sentence in Gogol’s “The Story of How Ivan Ivanovich Quarreled with Ivan Nikiforovich”. From: Folder 48 Senya Flechine Papers, IISH, Amsterdam. 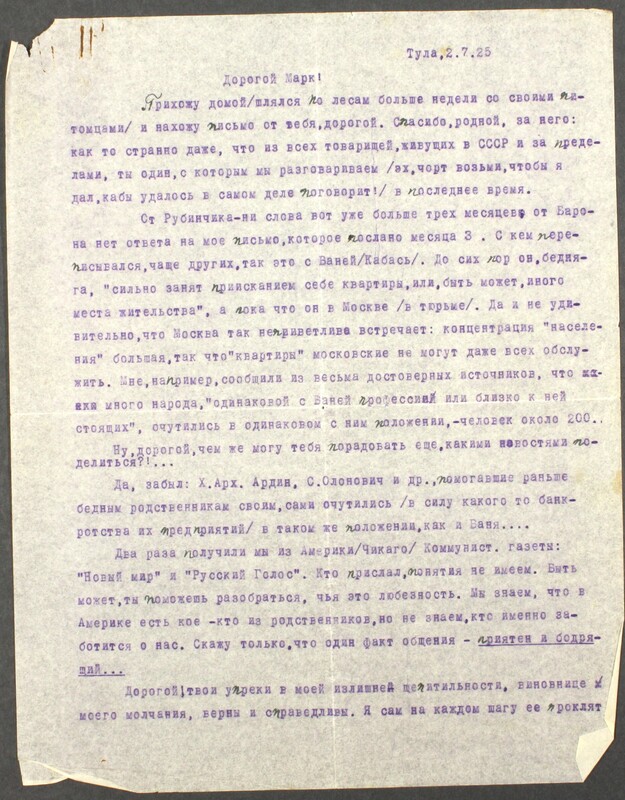 An extract was printed in "Bulletin of the Joint Committee for the Defense of Revolutionists Imprisoned in Russia", November-December 1925.. Translated by: Malcolm Archibald. Baron, Aron Davidovich. 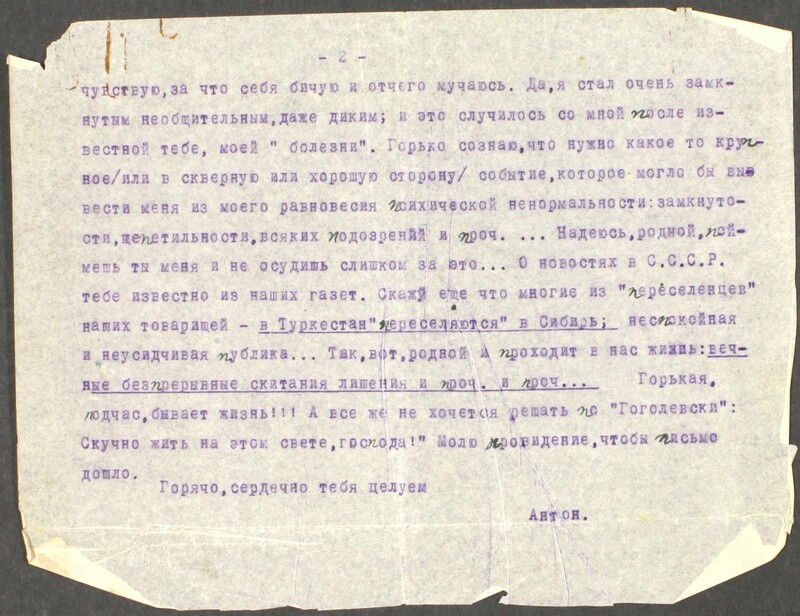 A Letter of Aron Baron from Tashkent  . Life in Exile [political exiles in Izhma, Komi Autonomous Oblast] .